Weddings are the last thing beekeeper Huck Anderson wants to be associated with, considering his past. So when he inherits a building occupied by a bridal boutique, he aims to evict the failing business and open a sporting goods store. Until his tenant ends up being Arianne Winters, a woman he’s indebted to from a mistake made years ago. When a life-threatening injury derails Huck entirely, Arianne offers a compromise to keep her boutique, and her life, out of bankruptcy—she’ll aid in his lengthy recovery if he’ll allow her to remain in his building. But nursing her adversary proves challenging when her adolescent crush resurfaces. Amidst a battle-of-wills, their lives intertwine in unexpected ways, providing opportunity to overcome their pasts and start anew. Will this confirmed bachelor consider holy-matrimony, or will Huck’s choices sting them a second time? 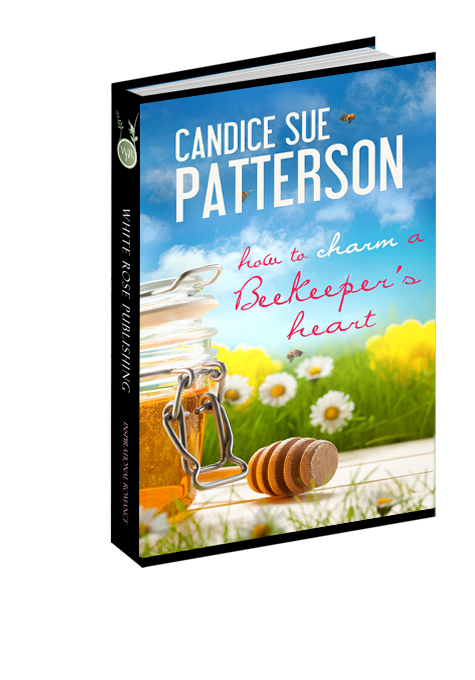 "Fans of Denise Hunter and Becky Wade will be delighted with Candice Sue Patterson’s How to Charm a Beekeeper’s Heart! From the adorable cover to the quotes about bees and Scripture verses that begin each chapter, this is a solidly written novel sure to charm the hearts of readers for years to come." "This story charmed and delighted me from beginning to the end. Realistic characters, not perfect facsimiles, tugged at my heart with their deep hurts and struggles to realize their dreams, old and new. Candice Sue Patterson’s exquisite writing creates a sweet buzz of pleasure in How To Charm a Beekeeper’s Heart. This book is highly recommended." Sixteen ounces of honey requires approximately 1,152 bees to visit 4.5 million flowers. This was one sick, twisted joke. Huck Anderson stared through his reflection on the glass storefront, rubbing his temple where a headache pulsed. On display, an oak frame supported white satin that gleamed in the sunlight. A yellowing guest book was propped in the corner window next to a vase of fake flowers. The breeze kicked up, lashing the American flag behind him on the courthouse lawn, the fabric snapping in the air. Uncle Marty’s grating laughter carried from somewhere on the wind. Good thing the old man was dead, or Huck just might kill him. He ground the toe of his boot into the sidewalk. This hadn’t been on his agenda for today. In fact, he’d rather fight a rabid moose with a cap gun. But according to the will, this was what Uncle Marty had left him, so he’d honor the man’s wishes. Even if it stripped his dignity. Huck ripped open the door, his neck and shoulder muscles threatening to snap like tightly coiled springs. His dusty boots met worn, purple carpet. A strong flowery stench made him sneeze—the smell of death. He curled his upper lip, searching the room for the owner or director, whatever they were called. No one. Not a sound. Catalogs stacked high sat to his right on a rough oak table. Sheer pink-and-white fabric hung over a full-length mirror opposite him. Looked like this place was in need of an undertaker too. A beat-up cash register swallowed the glass counter to his left. Frilly business cards caught his attention, and he lifted the girlie stock paper. Yesteryear Bridal Boutique, Pine Bay, Maine. The scuffed walls were as naked as his pride. What in the name of Uncle Sam was he supposed to do with a bridal boutique? So he’d gotten into some trouble when he was younger. Nothing he’d put Uncle Marty through was worth this. He wasn’t a pink-shirt-wearing, sissy-voiced, Say Yes to the Dress kinda guy. He’d seen the commercials. He didn’t have a feminine side. High-pitched giggles echoed from the rear of the building. A stout redhead in a huge wedding dress marched from the narrow hallway into the room. A gaggle of women followed her to the mirror, going nuts over the ugly thing. They didn’t even notice him standing there. He continued reading the card. Arianne Winters, Owner and Bridal Consultant. According to Uncle Marty’s lawyer, the woman hadn’t paid rent in almost a year. Now was the perfect time to turn this nightmare into something the town needed, like a sporting goods store or a bait and tackle shop. A petting zoo. Anything but this. Cameras clicked, and through the ruckus, he managed to pick out bits of conversation about blue garter belts, the flower girl’s hair, and what lingerie the bride planned to wear on the honeymoon. The word romantic had him eyeing the door. He needed to get out of here, could feel the testosterone leaching from his veins. “I’ll be with you in a moment.” A voice came from somewhere within the mass of women. Her full, red lips parted in a smile. Huck surveyed his reneging tenant. Blonde hair, curvy build, attractive in a classic way that drew him in. He almost laughed. Him? A groom? Never. “No, I’m Huck Anderson.” He offered his hand along with the famous Anderson dimples. She pressed her soft palm against his. Lightning flashed in her navy blue eyes, and her pretty smile faded to a pout. He studied her heart-shaped face. Those eyes. Something about her seemed familiar. Arianne Thompson. Wow. Twelve years had taken her gangly build and filled in all the right places. A fistful of shame walloped him in the chest, making his skin hot. He rubbed the back of his neck. He’d never expected to see her again. If there was one thing in life he could rely on, it was karma. “Is it all right to try on a veil?” the bride barked from the mirror. Poor guy. Whoever he was. Now what? Old insecurities crept into his gut. Maybe she’d forgotten. Though judging from the pinched look on her pretty face, she remembered. He did, now that she’d dredged up the memory. Arianne blinked. For a minute, he thought she’d stopped breathing. Huck removed the folded papers from his back pocket and offered them to her. “There’s no mention of that agreement in his will.” Huck pushed the papers along the countertop with his finger so she could read the contract terms. Question 1: How to Charm a Beekeeper's Heart is a Christian romance novel. Is your immediate reaction to Christian fiction positive or negative? Why? Question 2: Pine Bay and Summerville are both fictional towns in coastal Maine. Did you find Maine a good setting for a romance novel? Why or why not? Question 3: Over the course of the book, Candice writes from both Huck and Arianne's point of view. Did you enjoy this story opening in the hero's point of view? How was Arianne's point of view written differently than Huck's? Question 4: Which character did you connect with the most? Why? Question 5: Huck and Arianne are opposites in many ways. How did their differences help each other to grow? Question 6: Huck found it hard to believe in God because wasn't something he could see with his eyes or touch with his hands. Believing in God takes faith--seeing and touching with our hearts. Why do you think having faith is hard for some people and not for others? Question 7: Candice wrote this story to be symbolic to the Israelite's journey through the wilderness to the Promised Land--the land of milk and honey--found in Exodus of the Bible. Huck and Arianne journeyed through their own wilderness time and learned some hard lessons. Have you had a wilderness time in your life? Question 8: Huck and Arianne both had to accomplish personal and spiritual growth before they were ready for their "happily ever after." What traits do you think are necessary for a sound, solid marriage? Question 9: How would you describe Candice's writing voice? What elements of her storytelling worked or didn't work for you? Question 10: Which scenes did you enjoy the most in How to Charm a Beekeeper's Heart?